Hello, friends! Thank you so much for stopping by today as we celebrate the launch of Hero Arts Color Layering Catalog and new ink pad sets. Color Layering uses the technique of stamping progressively, building color and detail, resulting in an elegant, dimensional look. 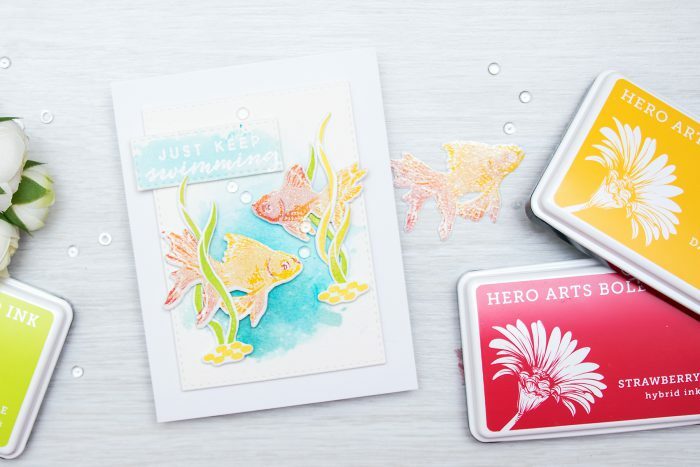 We’ve asked our talented group of artists to recommend their favorite colors to best highlight each Color Layering stamp set. 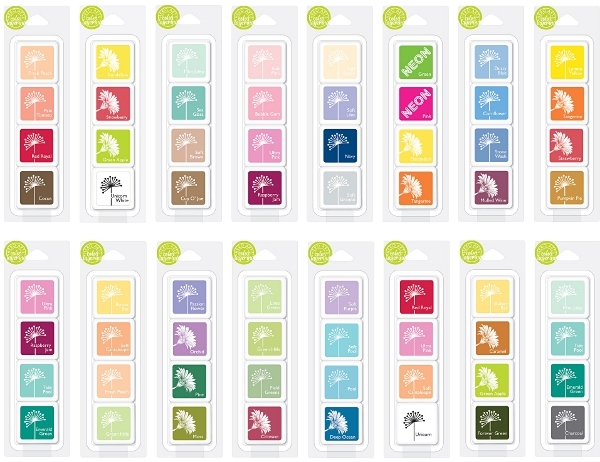 The results have been developed into 4-cube ink packs, featuring the championing artist’s name. While the inks were developed with a specific stamp set in mind, the packs offer wonderful and rich versatility; you’ll find they work well with most any set and often produce stunning and unexpected results. We’ve also introduced a fabulous new Color Layering stamp set with this release – the Color Layering Pineapple and coordinating Color Layering Pineapple Frame Cuts. There’s also an ink cube pack for this set, Hero’s Pineapple. I was so thrilled to contribute to this catalog and even more trilled to work with two my favorite Color Layering stamp sets from Hero – Gold Fish and Flamingo. It was not an easy task to pick up the right colors for these images, I did a TON of test stamping to see what colors would work best and also what colors I would like best for these sets. I also included a technique for each of my cards (and ink cube packs) that really lets you get more out of your inks. I’ll start with Gold Fish and my Yana’s Bolds Ink Cube Set (its so weird to see my name on a product! but good weird for sure). The colors of ink in the set are Dandelion, Strawberry, Green Apple (all 3 are new hybrid inks) and Unicorn White (pigment ink). The white ink is used to “mute” the bright yellow and red. By using this technique I’m able to reverse where the bright colors are on the fish. See THIS card example (and video) to see how you stamp these images differently. Step 1: ink the fish bottom layer (first layer) using Dandelion. Ink the tail using Strawberry. Mix the colors on the stamp with your fingertip or a q-tip. Stamp the image. When mixing ink with a fingertip you’ll get visible fingerprints on the image, but after you add next layers they will become invisible. Step 2: Stamp again with Dandelion only (this helps to mix the colors even more), use MISTI stamping tool for precise stamping. Step 3: Ink the fish detail layer (second layer) with White Pigment ink, stamp. Heat set or set aside for ink to dry on its own. Step 4: Die cut using a matching die or cut out with scissors. 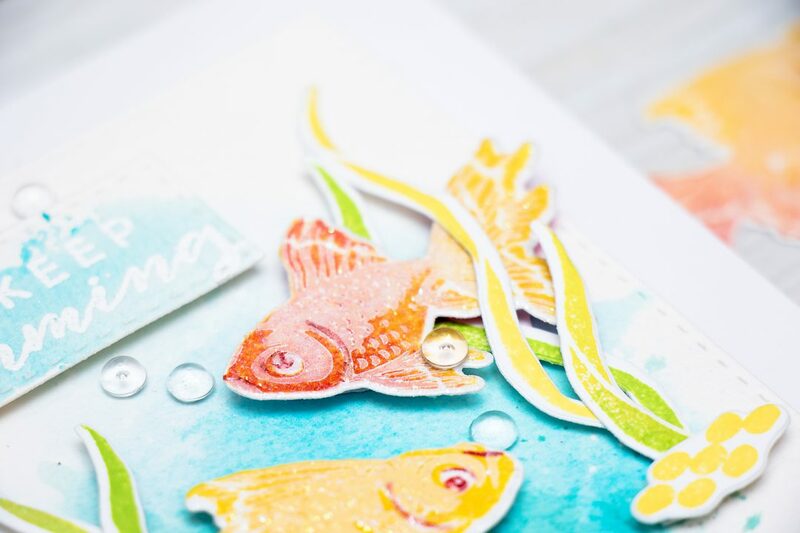 Step 5: Ink up the die cut with embossing ink, heat emboss with Sparkle embossing powder to make the fish look wet. I also included Green Apple ink in my ink set – I love to use this color to stamp sea grass, although its a great option to try for the fish too, it works beautifully with Dandelion. 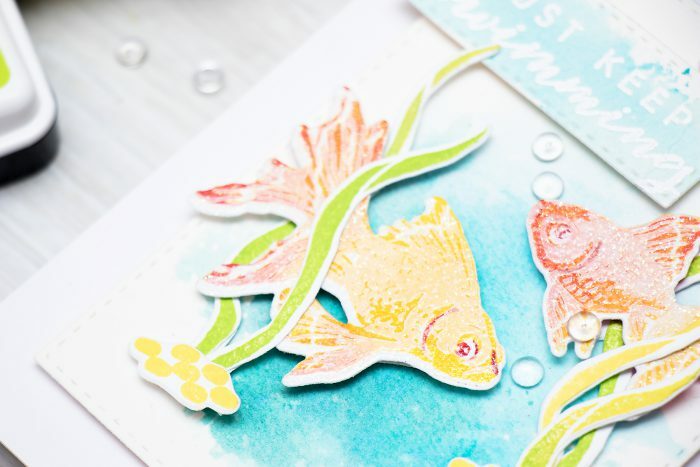 To create my card I stamped & die cut fish, sea weed and sea floor; to create the background I did ink smooshing with watercolors over watercolor paper and finally I heat embossed “Just Keep Swimming” in white embossing powder. 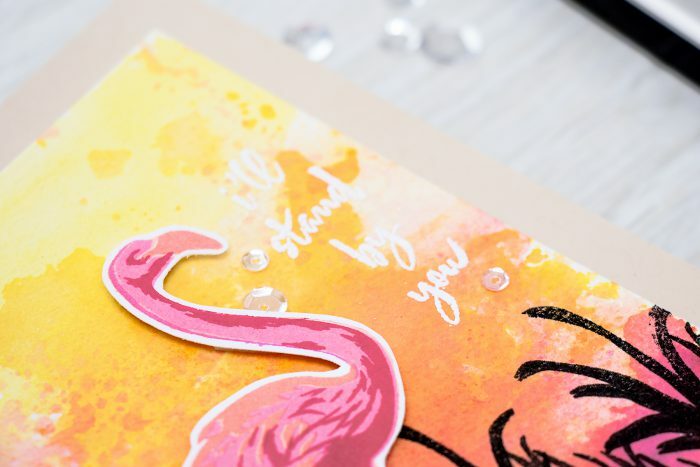 You’ll notice I added quite a lot of clear droplets, these are from Pretty Pink Posh – I think they work beautifully here adding faux air bubbles to the card. My second card and set is using Flamingo and Yana’s Sunset ink cube set. The colors of ink in the set are Soft Cantaloupe, Ultra Pink, Unicorn White and Red Royal. All but Unicorn are dye inks, Unicorn is pigment. 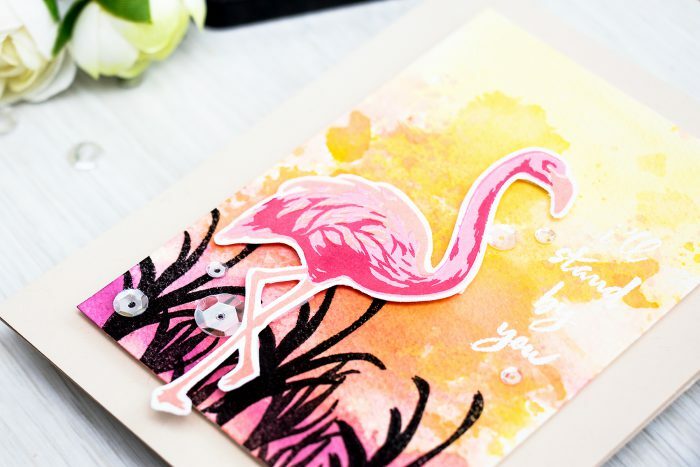 Whenever I think about flamingos I picture a vibrant sunset background and lots of bright colors, so that picture in my mind inspired this card. I also have another card HERE using Flamingo stamp and slightly different ink colors. Step 1: Stamp bottom layer + legs of flamingo in Soft Cantaloupe. Step 2: Stamp middle layer in Unicorn White. Stamp middle layer again in Ultra Pink. Step 3: Stamp top layer in Red Royal. You can also use black or another dark color to stamp the beak, but I skipped this step. To create the background I did some more ink smooshing with my watercolors and also stamped grass in black ink. My sentiment, I’ll stand by you, was heat embossed in white right next to the flamingo. Hero Arts will give away a Color Layering Bundle of the winner’s choice to FIVE lucky blog readers – selected from comments left across all blogs in the hop. Comments close Sunday June 19 at 11:59pm pt, Hero Arts will announce winner the following week. If you arrived from Kelly Rasmussen (and her gorgeous Kelly’s Flower set), the next stop on this hop is Amy Tsuruta (and her amazingly unexpected Shades of Green’s set). If you get lost, start over at The Hero Arts Blog. I love the bold colors on these cards. Great technique using the white ink to mute the bright colors on the fish. Both your cards are so fabulous! Your cards are always so beautiful! Thank you for the tips! Gorgeous cards! Love the colors! Wonderful background you created behind the flamingo!!! Great cards. So bright and happy. Oh my, your colours look amazing! Yana you always inspire me! Now I have to have both sets! Interesting use of white ink. I like it. Thanks for the giveaway and have a great week! Fantastic cards, as usual!! I especially love your Sunset Ink combo! I never thought I’d like to put fish on a card, but these are so beuatiful! 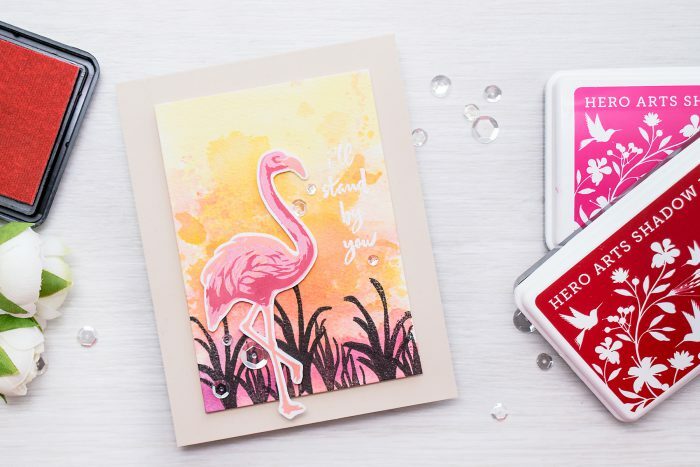 Love your fishies card and of course, living in Florida, the flamingo card. Wow! I have never done color layering before…next on my to do list! How exciting for you to have an awesome HA product named in your honor. Love the bright colors and the design of this card. Wonderfully done!